A planning approach that uses common tools in innovative ways to communicate about climate change and facilitate adaptation decision-making. Adaptation takes place in response to observed or expected changes in climate and climate variability through actions that reduce vulnerability and increase resilience. A diverse assembly of interested parties, each with their own values and attendant agendas, participates in adaptation decisions made by local governments. A fundamental challenge for adaptation planning is therefore to manage the multiplicity of stakeholders involved in the process, along with their (often) conflicting interests. This proposal describes a conceptual framework for a values-based approach to adaptation planning that harmonizes the myriad perspectives inherent to group decision-making. The approach uses familiar techniques for assessing vulnerability to climate change, while integrating methods from the social sciences to highlight the knowledge and experience of populations at risk. The purpose is to mitigate communication barriers that can limit adaptation decision-making by exploring and reconciling competing points of view among those affected by adaptation decisions. Many adaptation processes use geographic information systems (GIS) to ground their analyses in spatially nuanced evaluations of risk. GIS describes any collection of hardware, software, and practices associated with geographic data that organizes what we know about the world by making it easy to store, analyze, and visualize spatial phenomena. GIS is widely used by local governments for planning and management because it allows diverse actors to share information and create knowledge that can help serve the collective goal of protecting the health and well-being of communities. Most people associate GIS with graphical representations—usually in the form of a map—that communicate conditions, processes, and events across the human landscape. Vulnerability maps are commonly developed during adaptation planning to illustrate how communities may experience climate variability and change. Vulnerability has emerged as one of the central organizing concepts for adapting to climate change because it characterizes how impacts are manifested, thereby indicating which adaptation measures may be necessary and beneficial. For planning purposes, vulnerability can be thought of as a state of being that is determined by the biophysical and social processes that describe local conditions; it is formally defined as “the degree to which a system is susceptible to and is unable to cope with adverse effects (of climate change)” (Adger 2006, p 269). Central to the premise of vulnerability to climate change is understanding the potential for harm and, accordingly, the need for adaptation. Natural scientists, and those oriented toward scenarios of the future, express vulnerability as an outcome of the potential impacts of climate change. Outcome studies emphasize the biophysical determinants of vulnerability and draw attention to exposure (e.g. higher temperatures, reduced precipitation, rising sea level). On the other hand, social scientists and those interested in the cultural and economic diversity in which climate change occurs, analyze how vulnerability manifests in the context of political, economic, and social structures that interact dynamically to shape exposure. Contextual studies assume that exposure to climate change is mediated by institutional relationships (also known as adaptive capacity) and therefore underscore the social determinants of vulnerability. However, recent reviews suggest that vulnerability to climate change is also dictated by the way people perceive, experience, and respond to change in general (O’Brien 2009, Klinenberg 2013). A growing body of literature sheds light on the psychological barriers that exist for responding to climate change. Some of these include a persistent undervaluation of climate-related risks and over-confidence in one’s own coping ability; ideologies and worldviews that clash with science-based recommendations; money and behavior that create inertia through sunk costs; lack of trust; and denial (Gifford 2011). Confronting such affective appraisals of climate change is necessary to mitigate communication barriers that can limit adaptation decision-making. When planning adaptation to climate change it is therefore useful to consider both objective and subjective aspects of vulnerability. The objective aspects include external factors like exposure and adaptive capacity, while the subjective aspects encompass interior considerations such as emotion and self-efficacy. This proposal advances a conceptual framework for participatory adaptation planning that integrates objective and subjective understandings of climate change to assess vulnerability from multiple perspectives. The basic technique is to augment spatial representations of climate change with narratives of perceptions and experience. Participatory tools embedded within GIS processes (i.e. data collection, analysis, and visualization) create a platform for negotiation and debate to reconcile different situated understandings of the challenge that climate change poses and ensure that adaptation decisions satisfy the priorities and needs of vulnerable populations. Democratic ideals suggest that a wide range of participants should be drawn into adaptation planning and decision-making. In addition to government officials, the stakeholders for potential inclusion may consist of technical and scientific experts, environmental and business interests, community groups, and local residents. This level of public participation requires significant investments in time and patience on behalf of the planning agency, but the long-term benefits are well documented. Participatory processes deliver better decisions by providing access to a broader knowledge base, which in turn improves problem definition and strengthens the analysis. In addition, the inclusion of local knowledge, values, and priorities legitimizes decisions and prevents implementation problems by fostering commitment among stakeholders. Integral GIS is therefore conceived as a space for engagement to find out what matters most to people and establish the conditions of trust that will encourage parties to work together for a resilient future. Although GIS has traditionally been dominated by quantitative data and analysis, qualitative data and techniques are increasingly used in participatory approaches to spatial planning (McCall and Dunn 2012). Most technical barriers to data integration have fallen in recent years (Jung and Elwood 2010) and new analytical methods for mixed data types are now emerging. Integral GIS is one such strategy linking GIS objects (i.e. points, lines, polygons) to qualitative appraisals, thereby providing insights into people’s perceptions, values, and priorities. Planners have long advocated collecting this kind of subjective data in order to understand how people perceive their neighborhoods and what they value in their communities (Ceccato and Snickars 2000). Integral GIS makes those subjective considerations explicit by using them to generate different visions about vulnerability to help people see adaptation in new ways. Vulnerability maps are accessible and powerful devices that communicate climate-related risks for some geographic extent, i.e. a city or neighborhood. Methods for mapping vulnerability are dominated by indicator-based approaches that serve policy-makers’ needs for simple, generalized, and actionable information; some measure of exposure to climate change and some measure of adaptive capacity are mapped together to locate vulnerable areas and populations. However, qualitative methods are better at revealing the multi-dimensional nature of vulnerability by focusing attention on the knowledge and experience of populations at risk. Surveys and interviews of a diverse range of actors provide valuable insights into the determinants of vulnerability and, more importantly, the people, places and institutions that foster resilience. Integral GIS consolidates these two approaches by analyzing both objective and subjective understandings of the challenges that individuals and communities face. It can be seen as an exercise in knowledge construction and refinement where the focus is on “collaborative extraction of information from data and shared meaning from that information” (MacEachren and Brewer 2004, p 7). The three generalized stages of implementation are data exploration, negotiation, and presentation. Much of adaptation planning has to do with contextualizing knowledge: how the large-scale effects of climate change will manifest locally; how those manifestations play out against a backdrop of ongoing social and economic change; and how governance structures influence the extent to which local authorities can make independent planning decisions. Objective data in the form of empirical observations of change and the diverse social and environmental systems in which those changes occur provide the dominant inputs to how those questions are answered at the local level. At the same time, subjective considerations in the form of material and behavioral constraints and cultural norms reveal the processes, conditions and structures that exacerbate or ameliorate vulnerability. 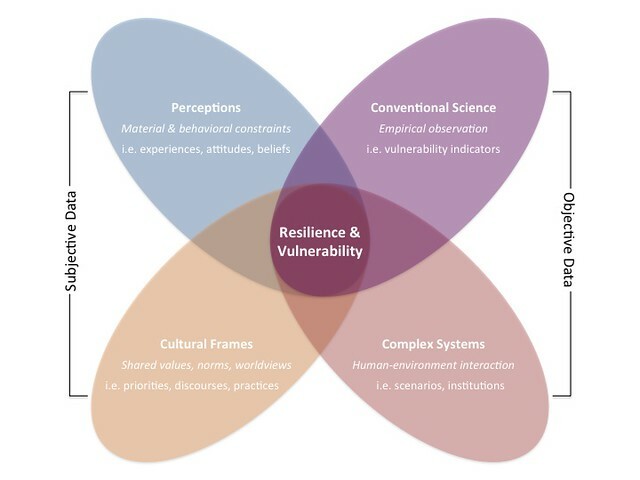 Analyzing climate change from each of these dimensions (Figure 1) provides a comprehensive view of local vulnerability and resilience. Figure 1: Data inputs for exploring vulnerability to climate change using Integral GIS. Spatial decisions—whether related to land use planning, environmental management, or highway routing—are generally contentious, and adaptation decisions are no different. Multiple (often conflicting) criteria, diverse participant backgrounds, and vague problem specifications characterize most adaptation situations. Integral GIS provides a frame of reference within which participants can share and integrate information, compare perspectives, and negotiate shared understandings. The act of mapping exposure, adaptive capacity, local knowledge, and experience creates boundary objects for participants to debate. By jointly interacting with the ensuing map, participants can begin to understand where their conceptions coincide and where they differ. Differences in interpretations can be reconciled through moderated discussions that use map-based graphics as vehicles for sharing and storing information. For example, visual tools embedded in GIS allows users to access mapped locations to which arguments refer, attach a geographical reference to each new argument, access discussion notes through symbols that signify geographical objects, and attach new notes to a map object or region (Figure 2). Those discussions are grounded in meanings that are attached to both geographical objects and arguments in the dialogue. The meanings, in turn, are constructed, shaped, and changed by the interaction of participants. The objective is to work iteratively—adding, subtracting, and modifying arguments—toward a shared understanding of local vulnerability and resilience. Figure 2: Built-in visual tools allow participants to access supplementary information about geographical objects and group discussions. In summary, qualitative research methods have been used to investigate the subjective dimensions of climate change by seeking to understand why some neighborhoods fair better during heat waves than others (Klinenberg 2002), as well as how coastal residents perceive the implications of sea-level rise on their lives and livelihoods (Moser 2013). The framework proposed here is designed to integrate the insights derived from such in-depth, place-based assessments with objective understandings of climate change through a process that structures meaningful discussions about where vulnerable areas and populations exist, as well as why they are vulnerable in the first place. Integral GIS is relevant to anyone responsible for commissioning or overseeing technical assessments of climate change impacts, vulnerability, and associated adaptation options. A government official seeking policies to become more resilient to the challenges created by climate change might initiate the process. City planners would manage the process and recruit appropriate stakeholders. GIS technicians already familiar with the spatial data and information used in local planning will be key technical allies for the mapping exercise. An outside facilitator will encourage problem exploration from a neutral position to enable openness among participants and mitigate potential conflicts. Integral GIS can be applied to any adaptation situation where GIS is already used in planning, such as municipalities / local authorities, business areas and those managing climate-sensitive sectors, and even community groups and non-governmental organizations who often implement government plans to achieve resilience. Responding to climate change has as much to do with how society creates changes and copes with them, as it does the actual changes associated with the climate system. People’s perceptions about the world are closely linked to values that influence how climate change is regarded and, ultimately, the kind of responses that are prioritized. Perceptions and values are therefore important factors at the individual and societal levels in determining whether and how adaptation takes place. Taking a values-based approach for adaptation planning as outlined here will also engage the psychological barriers that limit climate change mitigation and may motivate changes in behavior that support the reduction of greenhouse gases. Every adaptation situation is unique and costs will vary depending on the size of the community, business or organization doing the planning, as well as the scope of the objectives. Other GIS-based planning initiatives previously undertaken by the agency will provide a good basis for estimating the costs of developing an adaptation plan through Integral GIS. Costs unique to this approach may include the use of an outside facilitator to lead engagements between stakeholders, as well as the collection and coding of supplemental data. Adaptation planning through Integral GIS will follow a timeline similar to other participatory spatial planning processes, which do require more time in comparison to top-down planning. The goal of Integral GIS is to provide stakeholders genuine opportunities to construct, discuss, and promote divergent views and alternative options. Consequently, ample time should be set aside to identify and recruit stakeholders, schedule interviews and/or focus groups, and engage with the assembled actors in meaningful ways. Climate change finds a different echo in every individual depending on his or her personal, socio-economic, and historical identity, which is why it is crucial to have a diverse range of actors participating in adaptation processes (as underscored by the contest on adaptation and civil society groups). The proposal on Building Grassroots Voices seeks the inclusion of grassroots organizations in a similar manner to Integral GIS by recognizing that local knowledge and experience are important inputs to adaptation decisions. But Integral GIS also represents an attempt to shift cultural attitudes on climate change by acknowledging that individuals’ values inspire (and constrain) action. One possible application for Integral GIS is the proposal on Sunk Investments: by tapping into what people value, planners can start to understand the affective evaluations that shape property owners’ judgments about which adaptation process and outcomes might be successful. Adger, W. N. (2006) Vulnerability. Global Environmental Change, 16, 268-281. Ceccato, V. A. & F. Snickars (2000) Adapting GIS technology to the needs of local planning. Environment and Planning B: Planning and Design, 27, 923-937. Gifford, R. (2011) The Dragons of Inaction Psychological Barriers That Limit Climate Change Mitigation and Adaptation. American Psychologist, 66, 290-302. Jung, J. K. & S. Elwood (2010) Extending the Qualitative Capabilities of GIS: Computer-Aided Qualitative GIS. Transactions in GIS, 14, 63-87. Klinenberg, E. (2002) Heat Wave: A Social Autopsy of Disaster in Chicago. Chicago: University of Chicago Press, 328 pp. Klinenberg, E. (2013) Adaptation: How can cities be “climate-proofed”? In The New Yorker, January 7, 2013. pp 32-37. MacEachren, A.M. & Brewer, I. 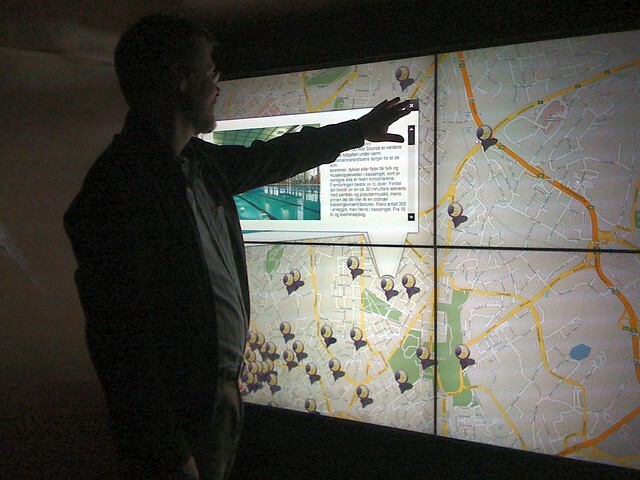 (2004) Developing a conceptual framework for visually-enabled geocollaboration. International Journal of Geographical Information Science, 18(1), 1-34. McCall, M. K. & C. E. Dunn (2012) Geo-information tools for participatory spatial planning: Fulfilling the criteria for ‘good’ governance? Geoforum, 43, 81-94. Moser, S. C. (2013) Navigating the political and emotional terrain of adaptation: Communication challenges when climate change comes home. In Successful Adaptation to Climate Change: Linking Science and Practice in a Rapidly Changing World, edited by S.C. Moser and M.T. Boykoff. Oxford: Routledge. O'Brien, K. L. (2009) Do values subjectively define the limits to climate change adaptation? Pages 164-180 in Adapting to climate change: thresholds, values, governance, edited by W. N. Adger, I. Lorenzoni & K. O'Brien. Cambridge: Cambridge University Press.